Many health practitioners take a double approach through starvation of the bacteria and active treatment. They believe it is important to stop feeding the bacteria. This means removing the foods they love to eat: sugars, carbohydrates and starches. They can live for several months without food so a diet that avoids these substances is required, and is the protocol listed in this cookbook. Along with starving them, it’s important to reduce their numbers by killing them. This can be done through herbal antimicrobials, antibiotics or both. When both approaches are taken (starvation and death), people have the best results. It’s also important to address stress levels, poor sleep and movement as these can impact recovery. Once the bacteria are gone, it’s important to reintroduce the good bacteria so they can help heal your gut and fight future battles against the baddies. In addition, it is also important to understand why the body developed SIBO in the first case. Just like bloating can be a symptom of SIBO, SIBO is a symptom of an underlying condition that allowed the bacteria to migrate and multiply in the small intestine. To find out how SIBO is diagnosed, click here. After being diagnosed with Small Intestinal Bacterial Overgrowth (SIBO) in early 2015, Rebecca went looking for cookbooks that were relevant to a SIBO diet. After much searching, she found none. There were a handful of resources online, but none of them followed the SIBO protocol that had been developed by Dr. Nirala Jacobi ND, Australia’s leading SIBO specialist. A keen cook, Rebecca began documenting all of the meals she made and has collated over 50 SIBO-safe recipes featuring summer produce. Rebecca believes in eating food when it’s at its best: in season. 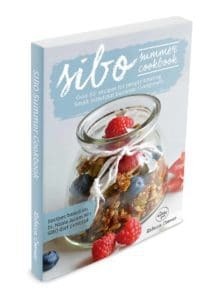 In this cookbook she uses a wide range of ingredients that will leave you feeling satisfied and happy to be eating a SIBO friendly meal.